You will play the game by choosing and going through different campaigns that all have different setups and information. Each campaign lists if it is introductory (1), Standard (4), Advanced (2), or Expert (1). 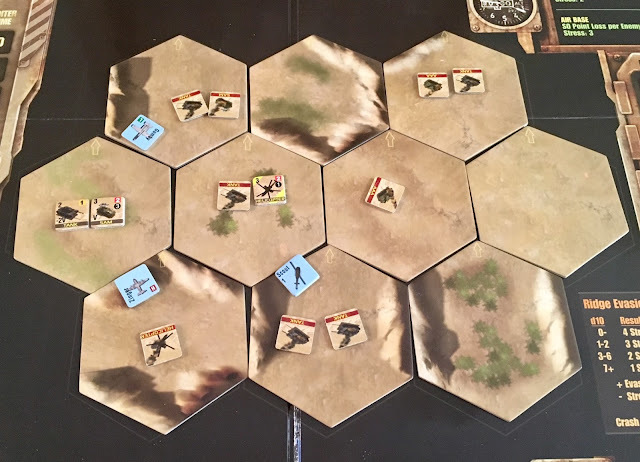 Each will give you an evaluation to let you know how well you executed the mission, the terrain tiles used, special instructions, and enemy points indicating how powerful their forces are. When choosing the enemy forces you will draw 2 assault battalion cards, a support battalion card, and a command battalion card. You will keep adding these forces until the number is higher or equal to the number stated on the mission card. Each battalion has a code that corresponds to the counter used and placed on the top right section of the board. 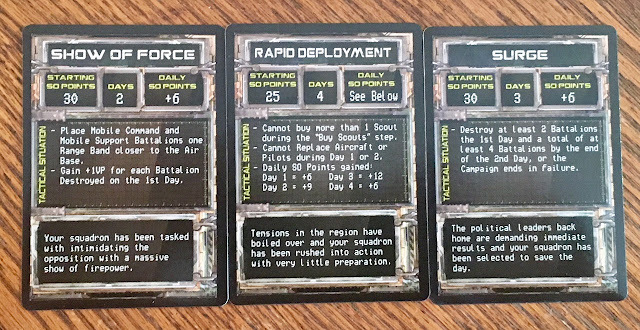 You will then use a situation card to pair with your mission card and will change the game giving you different SO points (this is what you use to buy all your stuff), different lengths of days to fulfill the mission, and adding special rules. Your aircrafts and pilots are represented by cards. 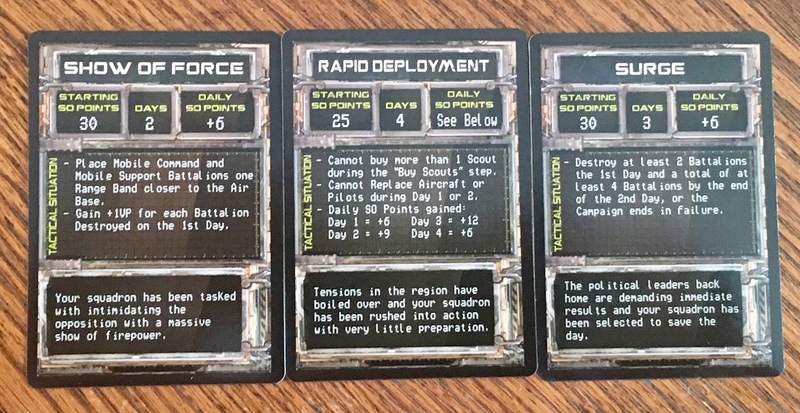 Each pilot has 3 cards that range from newbie to ace. 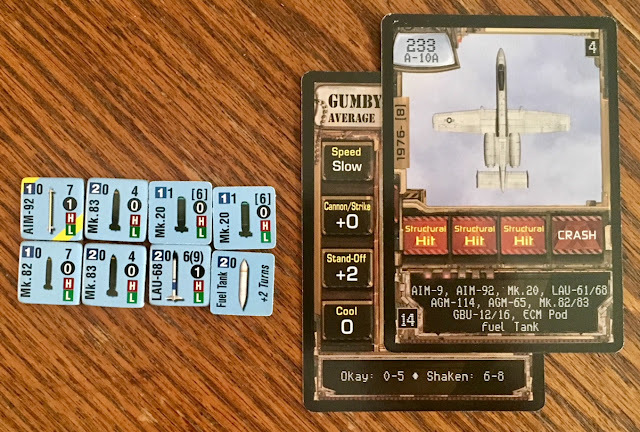 Each pilot has different stats and you can figure out a combination of pilots and aircrafts that you want. Your aircrafts will be equipped with weapons. Each weapon has a cost, a weight, and how much you need to roll to hit the intended target. You will setup the terrain and roll a d10 dice to randomly place the enemy on the board. Once they are placed you can place your aircrafts on any of the terrain hexes that is touching the outside. You will decide if your aircraft is low altitude, or high altitude. Flying low gives you better cover and less attention, yet crossing ridges is more dangerous and can add stress to your pilot. If you are flying high, you will draw a token indicating that someone saw you and popped up to join the fight. This will add another enemy token to the board. You will roll to see if enemy units have taken cover where you can't hit them as easily. You will then attack and move in any order for all your fast units. Enemy units will then fire at you if they can depending on their range and attack number. The enemy does not roll a dice, you will draw a counter that will give you the indicated result. You will then attack and move in any order for all your slow units. You will then start a new turn. You have to leave before you run out of fuel. 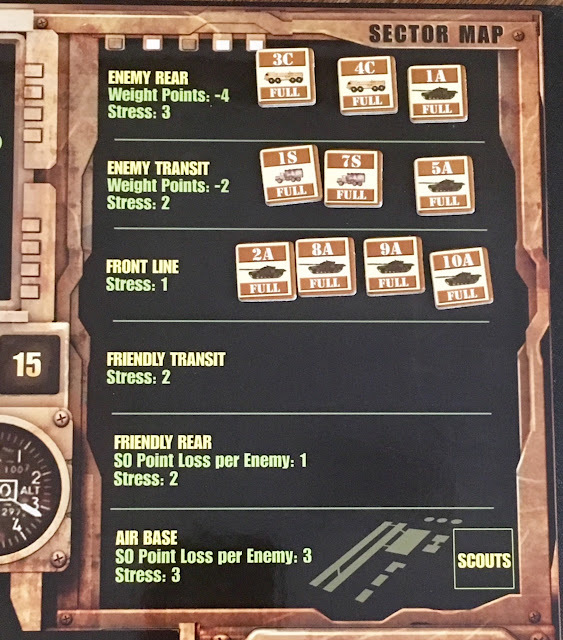 You will add up the numbers of the enemies still on the board and look at the indicated number on the card to know if half the battalion was destroyed or if they all were destroyed. 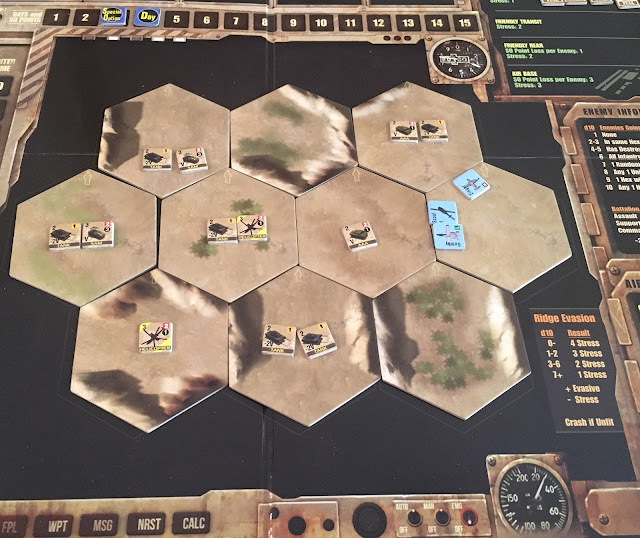 The theme and mechanics match as it's a war-game and uses similar mechanics seen in many war-games. There is a good variety of different weapons, aircrafts, and pilots that change that stats and the usage of each one. The mechanics match what could or would happen in real life and the game uses an area movement system that keeps track of tactical combat. You command a squadron of the U.S. Close Air Support which will take you on campaigns all over the world. The artwork replicates the looks of each weapon and aircraft. The terrain adds hills and flat areas that in incorporated into play and you can spot these areas on the tiles easily. The game uses a more realistic art style. I wish that there was more art on the pilots cards to more differentiate each pilot instead of uses just a couple different images. The components uses thick cardboard that is very appropriate for the game. The pilots have their own cards and can be changed from aircraft to aircraft if needed. 2. The decisions tend to be hard to make because you want to do the best move to setup for the next. 3. You are in charge of buying all your weapons you want and can play the way you want. 4. You get to pick your pilots and they can get upgraded. 5. The game is so dynamic that each time you play it will cause different situations. 6. The theme is strong in game play. 7. 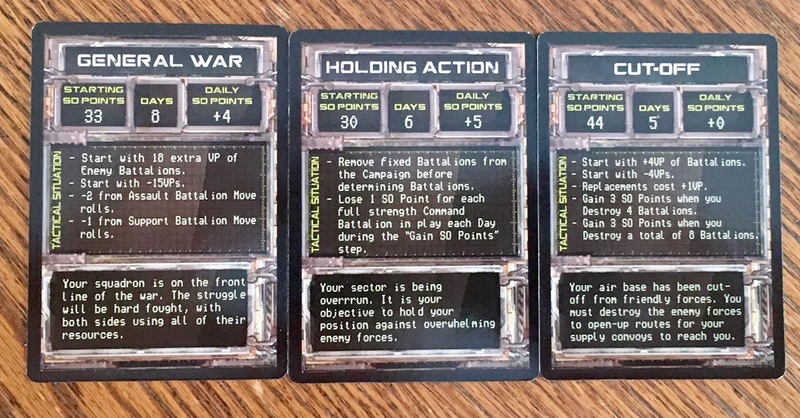 Campaign cards can be different each time due to situation cards that will change some rules. There are 48 different combinations between the campaign cards and situation cards. 1. The art for the pilots should be more varied and individualized more. 2. The rulebook is set up like a war game rulebook and if you haven't played a war game, you might be intimidated. The game feels like a wargame and an RPG hybrid. The game does such a good job to let you level up your pilots and keep track of stats that when you go to your next mission, you have connected with certain characters you have and don't want to loose them. This game is a great game to play for someone who wants to be introduced to a great war game right off the bat, but might be easier to pickup if you have played Hornet Leader or Phantom Leader or any other war-game. 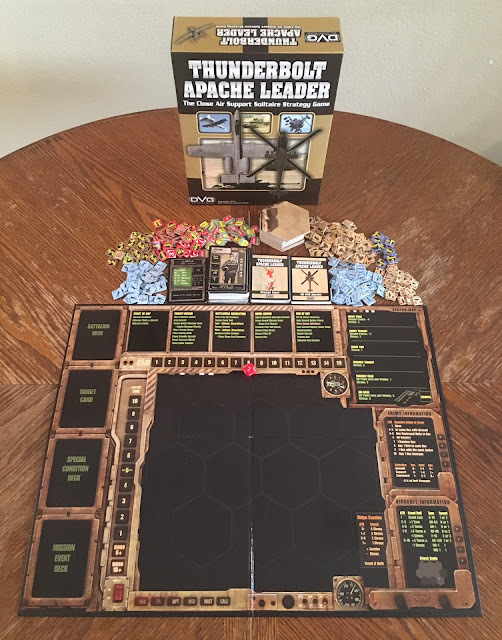 The game seems heavy and reading the rulebook seems daunting at first, but once you play a mission you will remember how everything works and will be able to understand how the game flows. Half of the game takes place before combat as you need to plan by choosing your weapons, aircrafts, and pilots. This is an important part as your pilots become better as they fly, but can also become fatigued. Players who like war-games, campaigns driven games, and/or solo games will love this game. If you enjoy any of those types of games you will have to give this game a go, as you will really be missing out if not. 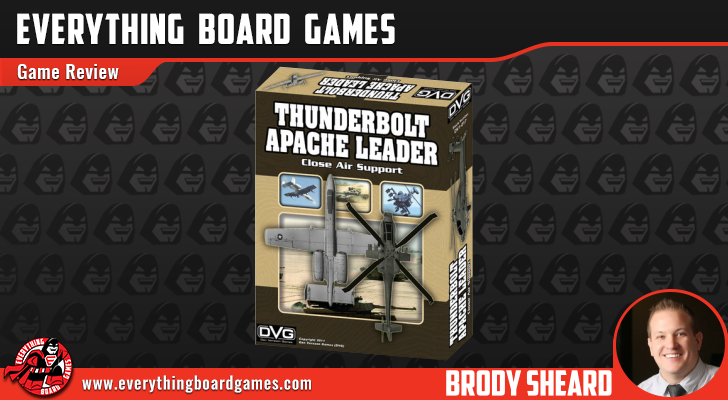 I am giving Thunderbolt Apache Leader a 8.5 out of 10 super meeples.